Which Programming Code to Learn? EDITOR’S NOTE: The following edited article is printed with permission from WhoIsHostingThis.com/blog, where you can see the original version. Today, computers are integral to our lives. The more we understand them and how they work, the better we’re able to use them. Learning to code can result in a lucrative career as a computer programmer, and is also incredibly useful. Learning programming isn’t always about creating a finished product. Understanding how programming works teaches computational thinking, logic, and problem-solving skills, which can be applied in any field. It’s not difficult to learn programming with all the free resources available, but it is necessary to select the right language. It all depends upon the goal. Compare the options below. PHP and SQL are easy to learn, even for beginners. You can learn PHP with mySQL without buying any software. Since PHP and SQL run the most popular content management system, they are a good place to start. But any programming skill is in demand from top companies, and can provide a hefty salary. Code.org: Get free tutorials for a number of languages. Especially suited for K-12 students. Here is a list of programming languages, including what they are used for, how much programmers make, and more. See also the list of sources at the end of the original article. PHP can generate dynamic page content; create, modify, and close files on the server; collect form data; send and receive cookies; modify database data; and encrypt data. For output, it can support HTML, images, PDF files, Flash movies,and any text, such as XHTML and XML. 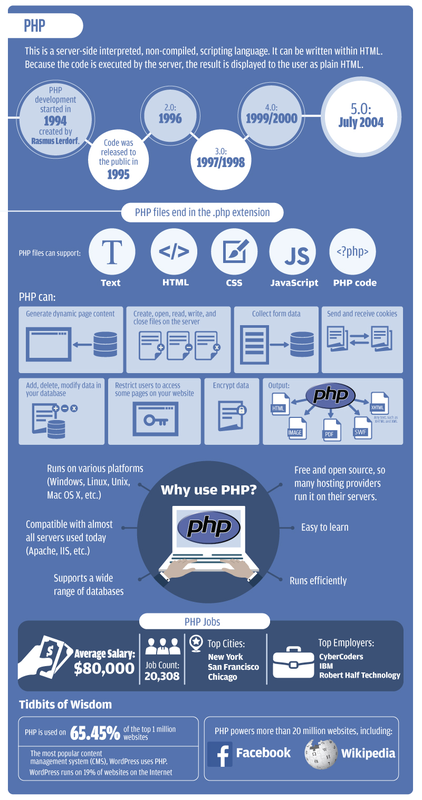 PHP runs on various platforms (Windows, Linux, Unix, Mac OS X, etc.) and is compatible with almost all servers used today (Apache, IIS, etc.). It supports a wide range of databases, and is free and open source, so many hosting providers run it on their servers. It is also easy to learn and runs efficiently. The average PHP programmer makes $80,000, and there are about 20,000 PHP jobs. The top SQL cities are New York, San Francisco and Chicago. The top employers are CyberCoders, IBM, and Robert Half Technology. PHP is used on 65 percent of the top 1 million websites, including WordPress, Facebook, and Wikipedia. SQL is not a programming language or a markup language. It is the standard way to interact with databases. MySQL is the most common, and is a good start for a web developer. SQL was first developed in 1979. SQL files have a .sql extension. SQL can query a database and retrieve data, insert and update database records, create new databases and tables, create database views, and create permissions on database access. 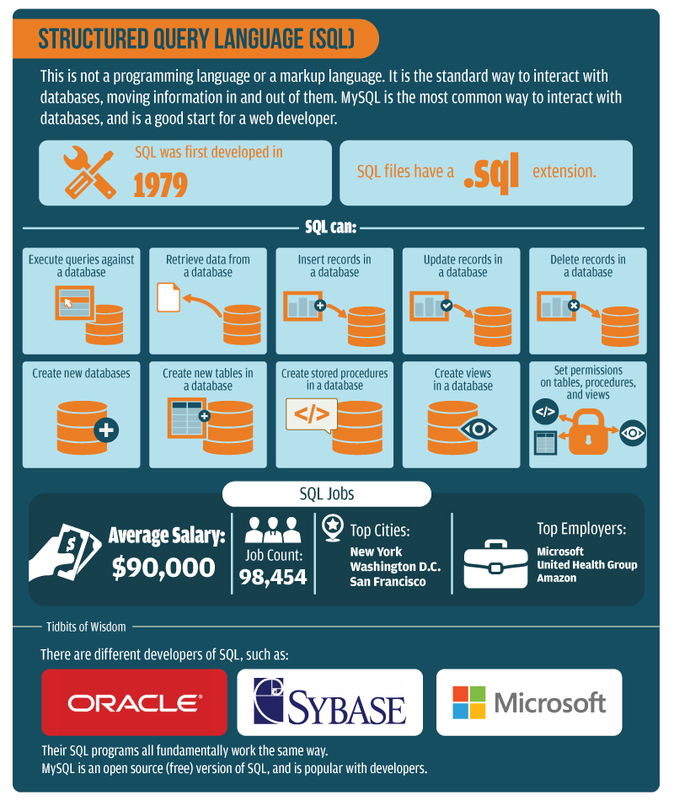 The average SQL programmer makes $90,000 and there are 98,000+ SQL jobs. The top SQL job cities are in New York, Washington D.C., and San Francisco. The top employers are Microsoft, United Health Group,and Amazon. There are different developers of SQL, such as Oracle, Sybase, and Microsoft, but their SQL programs all fundamentally work the same way. MySQL is an open source (free) version of SQL, and is popular with developers. 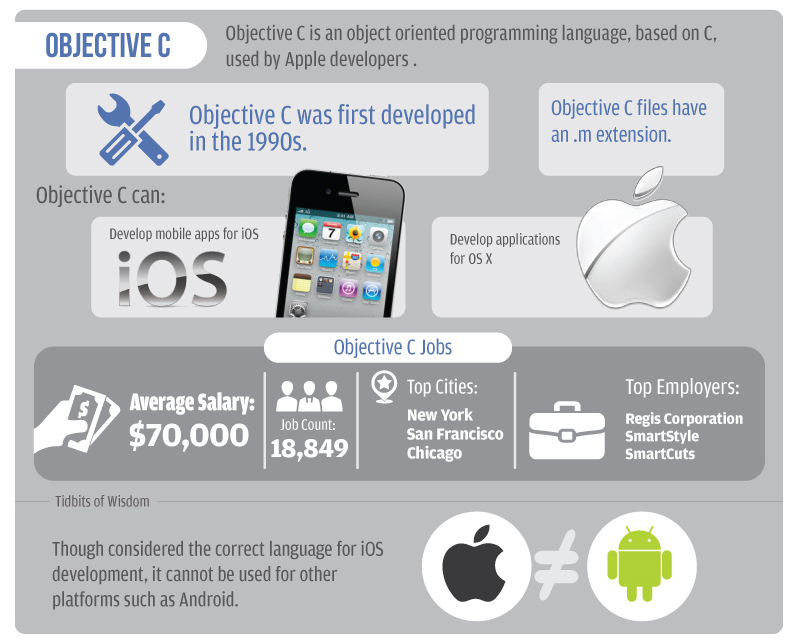 Objective C is an object oriented programming language, based on C, used by Apple developers. It was first developed in the 1990s and Objective C files have an .m extension. Objective C can develop mobile apps for iOS and applications for OS X. The average Objective C programmer makes $70,000 and there are about 19,000 Objective C jobs. The top Objective C job cities are New York, San Francisco, and Chicago. The top employers are Regis Corporation, SmartStyle, and SmartCuts. Though considered the “correct” language for iOS development, Objective C cannot be scaled for other platforms such as Android. 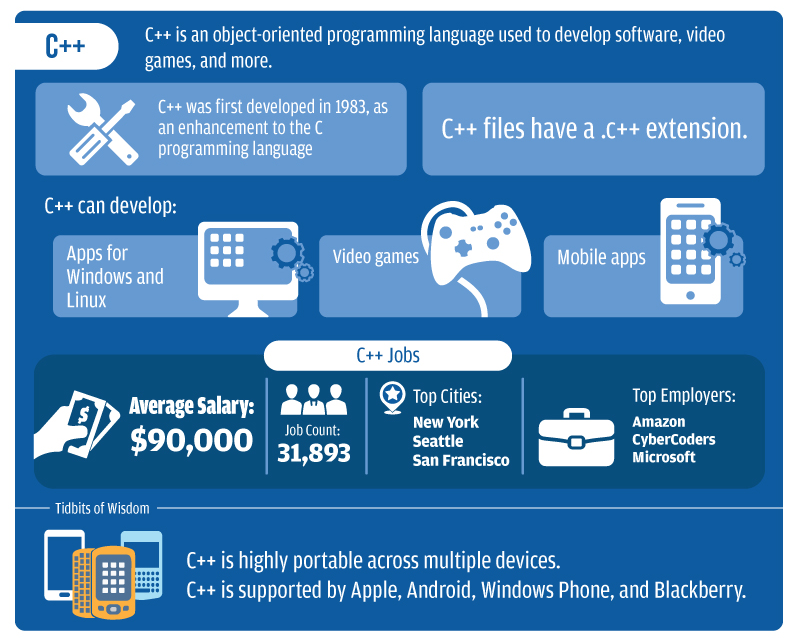 C++ can develop apps for Windows and Linux, video games, and mobile apps. The average C++ programmer makes $90,000 and there are about 32,000 C++ jobs. The top C++ job cities are New York, Seattle, and San Francisco. Thetop employers:are Amazon, CyberCoders, and Microsoft. C++ is highly portable across multiple devices and is supported by Apple, Android, Windows Phone, and Blackberry. Java lets you play online games, upload photos, take virtual tours, and use interactive maps. 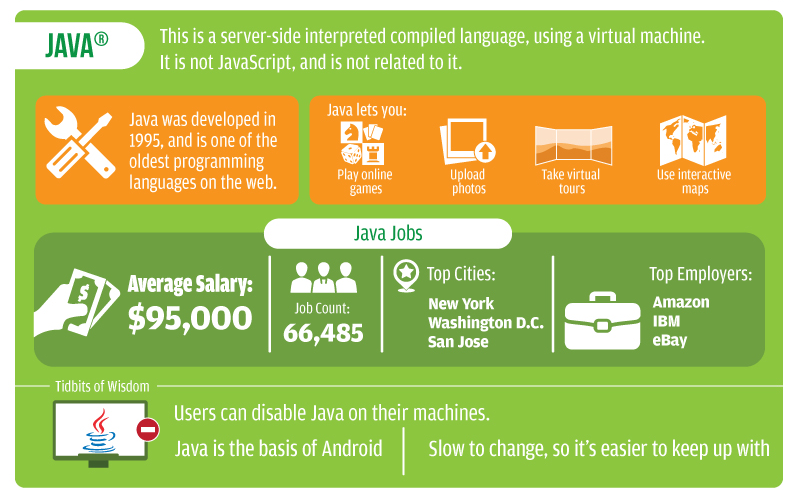 The average Java programmer makes $95,000 and there are more than 66,000 Java jobs. The top Java job cities are New York, Washington D.C., and San Jose. The top employers are Amazon, IBM, and eBay. Java is the basis of Android. It is slow to change, so it’s easier to keep up with. Python can build websites, provide database access, build desktop graphic user interfaces (GUIs), and build software and games. The average Python programmer makes $83,000 and there are more than 19,000 Python jobs. The top Python cities are Mountain View, CA, San Francisco, and New York. The top employers are Amazon, Intel®, and Dell. 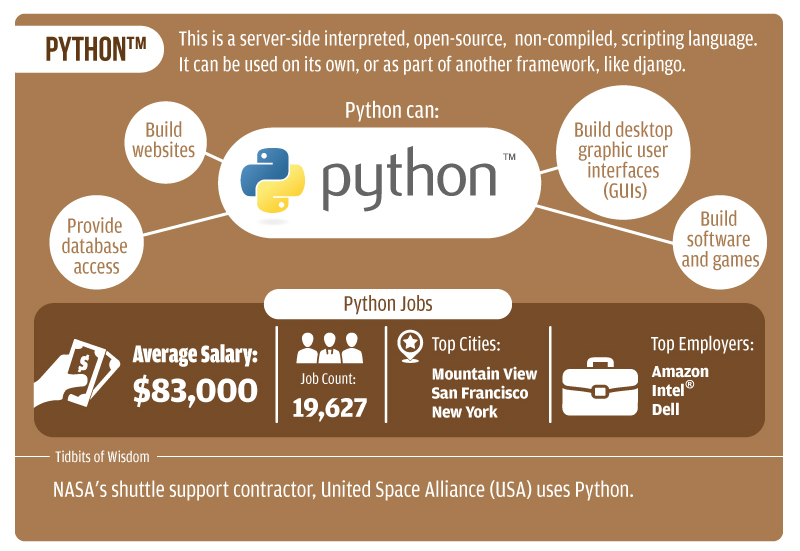 TNASA’s shuttle support contractor, United Space Alliance (USA) uses Python. It’s easier to learn compared with other languages like C++. It is gaining popularity because of its use with Rails: Ruby on Rails. Rails is a rapid development framework, like django or Python. Ruby is a blend of Perl, Smalltalk, Eiffel. Ada, and Lisp. Ruby can build web sites, simulations, and web applications. 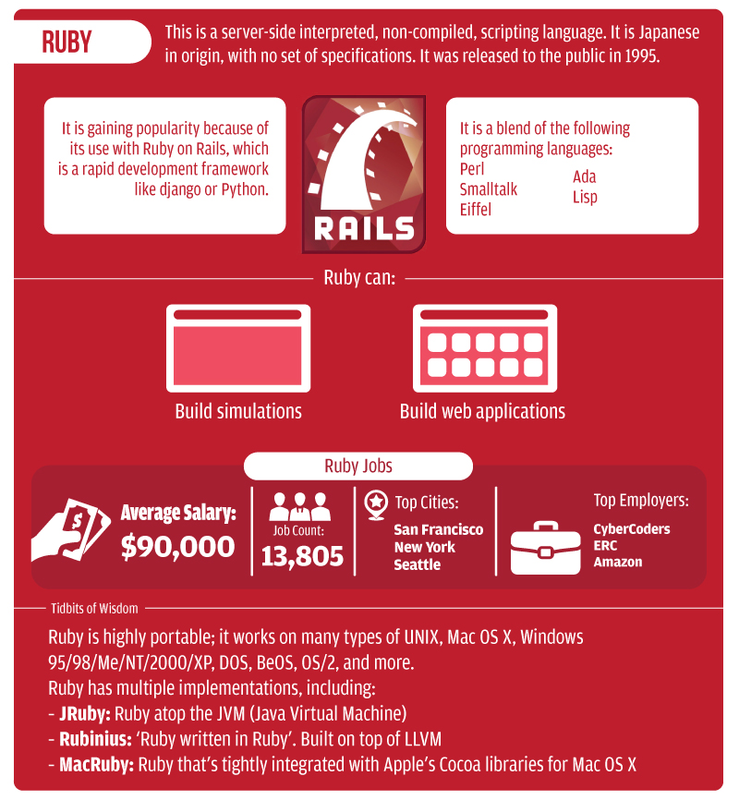 The average Ruby programmer makes $90,000 and there are about 14,000 Ruby jobs. The top Ruby job cities are San Francisco, New York, and Seattle. The top employers are CyberCoders, ERC, and Amazon. Ruby is highly portable. It works on many types of UNIX, Mac OS X, Windows 95/98/Me/NT/2000/XP, DOS, BeOS, OS/2, and more. Ruby also has multiple implementations, including JRuby [Ruby atop the JVM (Java Virtual Machine)]; Rubinius (‘Ruby written in Ruby’. built on top of LLVM); and MacRuby (Ruby that’s tightly integrated with Apple’s Cocoa libraries for Mac OS X). ASP.Net is a server-side interpreted, non-compiled, scripting language. It is similar to PHP, but runs only on a Windows® server, because it is a Microsoft product, in the .net suite of programing languages. ASP.Net can build websites, web applications with a Model View Controller (MVC) design, and web forms. 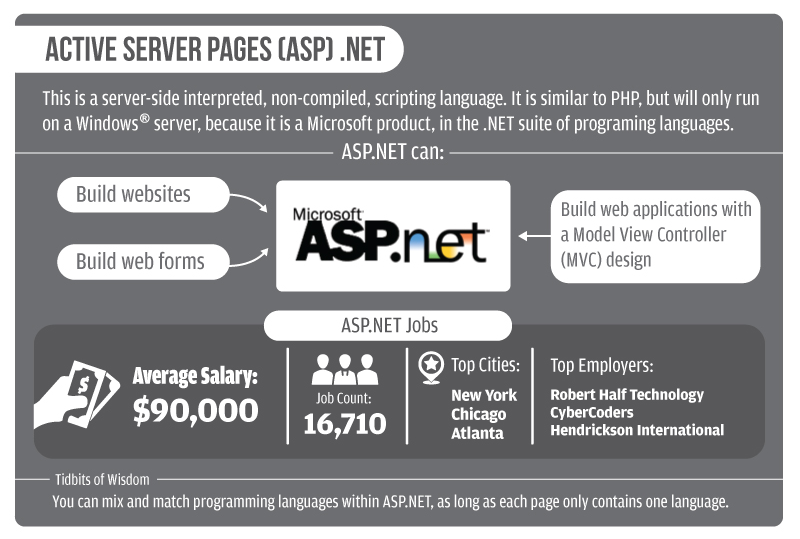 The average ASP.Net programmer makes $90,000 and there are about 17,000 ASP.Net jobs. 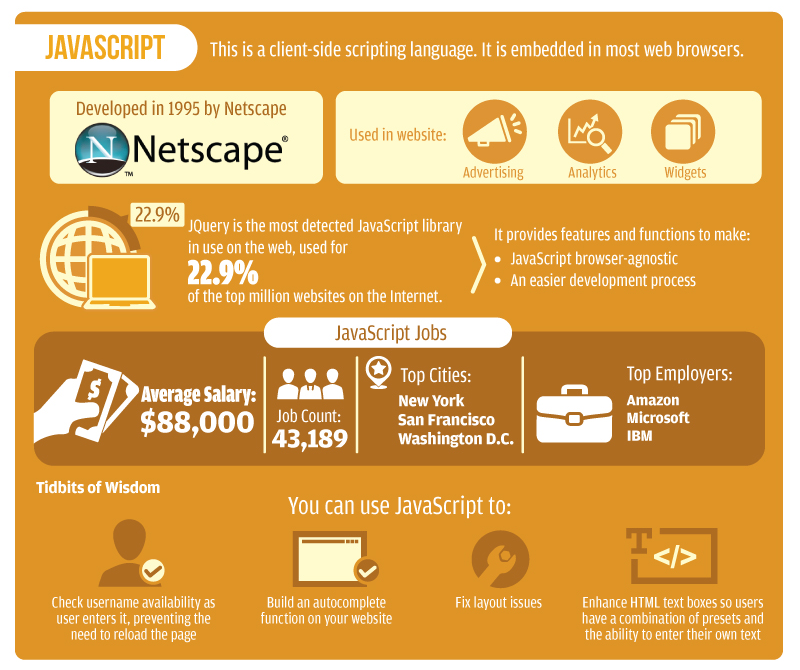 The top ASP.Net job cities are New York, Chicago, and Atlanta. The top employers are Robert Half Technology, CyberCoders, and Hendrickson International. 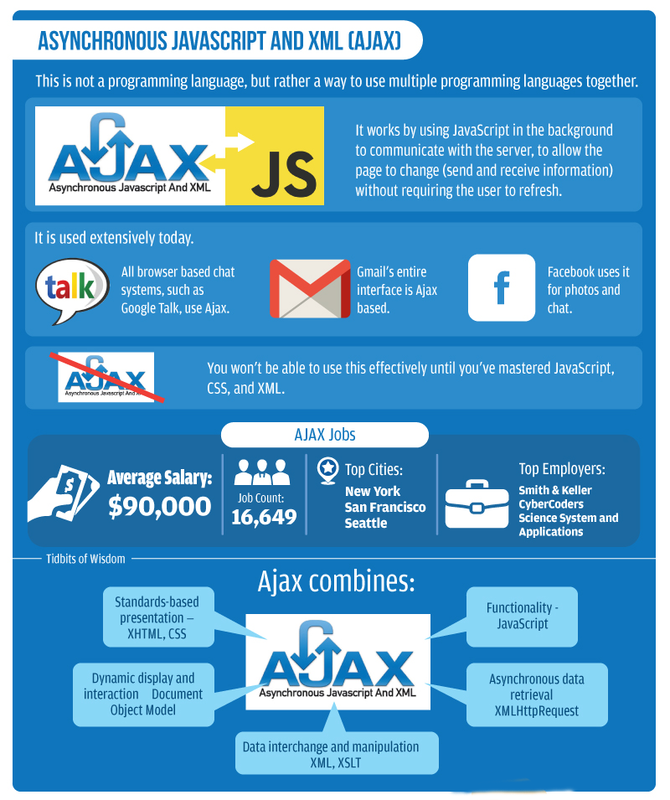 The average Ajax programmer makes $90,000 and there are about 17,000 Ajax jobs. The top Ajax job cities are New York, San Francisco, and Seattle. Thetop employers are Smith & Keller, CyberCoders, and Science System and Applications. Above given programming codes are useful,i want to know python header,syntax.